NAFTA gets an upgrade with new provisions on autos, dairy, and more. 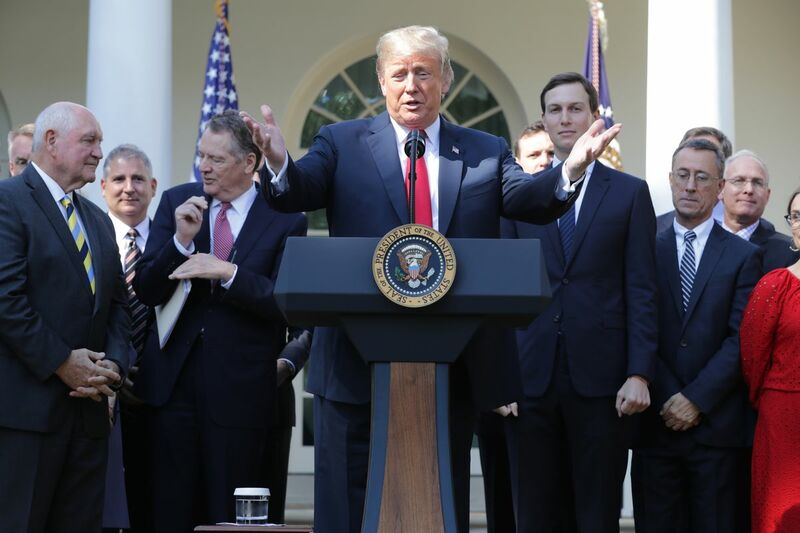 President Donald Trump talks about the USMCA in the Rose Garden on October 1, 2018. Say goodbye to NAFTA — and hello to the USMCA. Just before the midnight deadline on Sunday, the US and Canada struck a deal on trade and announced the framework for a new, revised NAFTA — now known as the United States-Mexico-Canada Agreement, or USMCA. “Once approved by Congress, this new deal will be the most modern, up-to-date and balanced trade agreement in the history of our country, with the most advanced protections for workers ever developed,” Trump said in a speech announcing the deal in the White House Rose Garden on Monday. New name or not, USMCA isn’t quite a “brand new deal,” as Trump described it. It’s basically NAFTA 2.0: an updated version of the nearly 25-year-old trade agreement, with major changes on cars and new policies on labor and environmental standards, intellectual property protections, and some digital trade provisions. But experts say the changes are significant — even if they don’t quite match Trump’s bloviating. “It’s a substantially different agreement than NAFTA,” Richard Miles, director of the US-Mexico Futures Initiative at the Center for Strategic and International Studies, tells me. The three leaders are preparing to sign the USMCA before the end of November — possibly at the G20 summit in Buenos Aires, Argentina. But all three countries must still ratify it. Congress likely won’t even consider the agreement until 2019, and it’s possible that power could shift to the Democrats in one or both chambers after November’s midterm elections. If that happens, Congress might be a little more reluctant to give the president a win by ratifying the deal. Since the approval process will take some time, most of the new USMCA provisions won’t go into effect until 2020. In the meantime, debates in Canada, Mexico, and the US will play out over the following months about whether these revisions are wins or losses — and whether this new trade agreement is a real improvement on what came before. Here’s what you need to know about USMCA, the trilateral trade agreement formerly known as NAFTA, and what it means for the three countries and for Trump’s trade strategy. What’s new in the deal, and how big of an impact will it have? Under the new deal, cars or trucks must have 75 percent of their components manufactured in Mexico, the US, or Canada to qualify for zero tariffs. This is a substantial increase from 62.5 percent in the original NAFTA. The goal is to boost auto parts manufacturing in North America by forcing car companies to use parts made here versus cheaper parts from Asia. This will probably increase the cost of cars and trucks, and it might make it harder for Mexico to make or sell certain smaller cars here in the US. The most striking difference from NAFTA involves protections for workers in all three countries. The new agreement calls for 40 to 45 percent of automobile content to be made by workers who earn at least $16 an hour by 2023. This provision specifically targets Mexico and is meant to bring wages there up to US and Canadian standards. That’s good for Mexican workers, but that’s not the only motivation behind it. The Trump administration hopes that if Mexico no longer pays its workers a lot less than the US and Canada do, companies will no longer have a reason to move their factories there (and out of the US), thus keeping manufacturing jobs in the US and Canada. In addition, Mexico has agreed to pass laws giving workers the right to real union representation, to extend labor protections to migrants workers (who are often from Central America), and to protect women from discrimination. And unlike NAFTA, the new deal allows each country to sanction the others for labor violations that impact trade. It’s a complex, multi-step process modeled after similar protections in the Trans-Pacific Partnership (TPP), a multinational trade deal that Trump pulled the United States out of after taking office. These are much-needed reforms, and they address a lot of concerns that US labor unions have long had about NAFTA. But the labor provisions also offer certain complications — particularly how to enforce the $16-an-hour wage rule. “That appears to be a bit of a nightmare in terms of administration and red tape,” says Duncan Wood, the director of the Mexico Institute at the Wilson Center. That’s because it’s not quite clear how countries are going to keep track of how much companies in Mexico are paying their workers, or how Mexican companies will determine that everyone is making $16 an hour. This has been a pet issue for Trump and is thus considered a win for the US — and probably Canadian consumers. Canada uses what’s called a supply management system for dairy (and eggs and poultry), which closely regulates how much of each product can be produced and places strict tariffs and quotas on those items when they’re shipped into the country. The US got Canada to open up its dairy market, starting with a six-month phase-in of access that goes up to about 3.6 percent — an amount just slightly above that which was negotiated in the TPP. Canada also agreed to eliminate Class 7 milk, which made it cheaper to buy certain high-protein milk products from domestic producers in Canada; US farmers complained that it blocked their ability to export their products to Canada. But US dairy farmers won at the expense of Canadian farmers — at least, that’s starting to be the view in Canada. Sarah Goldfeder, a principal at the Earnscliffe Strategy Group and a fellow at the Canadian Global Affairs Institute, says that though the Canadian dairy industry can likely absorb these changes, farmers and farmer associations are realizing they basically got screwed over. This is a win for the United States. The new agreement extends the terms of copyright from 50 years beyond the life of the author to 70 years beyond the life of the author. It also offers increased protections for biologics, certain types of drugs, from eight years to 10 years — which basically extends the period that a drug can be protected from generic competition. Also, NAFTA was negotiated more than two decades ago, so it didn’t really deal with the internet. The USMCA aims to fix that by adding new provisions to deal with the digital economy — that is things like e-commerce and data. These new digital provisions include things like no duties on products purchased electronically, such as music or e-books, and protections for internet companies so they’re not liable for content their users produce. Some experts told me these digital trade provisions fall short of what’s needed for a modernized NAFTA, but it’s a start. One of Canada’s red lines was the preservation of NAFTA’s Chapter 19, which set up an independent mechanism to resolve special trade disputes between the countries (rather than trying to fight it out in domestic courts). Canada saw Chapter 19 as a way to defend against protectionist trade policies by the US, and it prevailed in this goal. In the original NAFTA, a provision known as Chapter 11 gave investors the ability to sue governments over changes to policies that they claim would harm future profits. It’s been eliminated for the US and Canada and has been restricted in Mexico except for a few sectors, including energy. This might mean that investors, particularly in Mexico, are less protected than they were under the original NAFTA, but it’s also being applauded for eliminating a mechanism that companies used to challenge government health and environmental regulations. In some ways, Section 232 tariffs have dictated the NAFTA debate more than the actual terms of the agreement. Section 232 is basically a trade loophole that Trump has used to impose steel and aluminum tariffs on Canada, Mexico, and the European Union. But this isn’t really about national security — that just happens to be the legal argument the administration is using to establish that it has the legal authority to do this. If this were just about national security — that is, making sure we have reliable access to steel in the event of a major war — the fact that we get much of our steel from close allies should satisfy that requirement. In reality, Trump is trying to boost the domestic US steel industry. Both Canada and Mexico wanted protections from these tariffs — Canada, in particular, finds these tariffs insulting since it is such a close defense partner of the US. But the USMCA doesn’t exempt the countries from those tariffs. They did get the US to make a side agreement that largely protects them from possible auto tariffs under 232, but the steel and aluminum tariffs remain in place. Trump said at his press conference Monday that he has no plans to remove those tariffs, though administration officials said Sunday that the issue was being discussed separately. But for now, Mexico and Canada will avoid crippling auto tariffs, though they’re still vulnerable to other Section 232 tariffs. This new agreement puts in a 16-year “sunset” clause — meaning the terms of the agreement expire, or “sunset,” after a set period of time. The deal is also subject to a review every six years, at which point the US, Mexico, and Canada can decide to extend USMCA. It’s a compromise from the five-year sunset clause that the Trump administration originally proposed. These are some of the agreement’s highlights, but there are plenty more tweaks. Most of the provisions won’t go into effect until 2020, so it will be a while until American (or Canadian or Mexican) consumers and workers experience the effects of the new NAFTA. It’s likely that American consumers will eventually pay a bit more for cars as a result of the deal, and while the administration’s goal is to keep manufacturing jobs in the US, it’s too early to predict what the consequences on the workforce will be. If you’re an American dairy farmer, you’re probably celebrating — American agriculture, in general, does very well under the new deal. Canadian farmers aren’t thrilled, but Canadian consumers could benefit, not just on dairy but also on things such as online shopping and wine. Finally, the new labor provisions mean that Mexican workers stand to benefit, with greater workplace protections and possibly higher wages. Trump, Trudeau, and Peña Nieto have to sign the agreement, which they plan to do before Peña Nieto leaves office at the end of November. Mexican Economy Secretary Ildefonso Guajardo Villarreal said Monday that the three leaders may sign the deal at the G20 summit in Buenos Aires in November. But that’s the easy part. The agreement needs to be ratified by all three governments. Mexico is the most dependent on NAFTA — or USMCA — among the three countries, so it has the most to lose, said Miles. Incoming leftist president Andrés Manuel López Obrador had already said he won’t renegotiate the deal, and his backing will likely ease USMCA through Mexico. Canada’s concessions to the US on agriculture have roiled politics in the aftermath of the agreement — and there’s also some pushback on Canada’s inability to resolve steel and aluminum tariffs and all the issues around Section 232. That might not necessarily stop it from going through the Canadian Parliament, but it may end up as a campaign issue when Trudeau calls federal elections next year. “There’s a lot of fodder here for an upcoming election year, but I also think there’s no way it wasn’t going to be an election issue. Whatever deal he got, he was going to get hit by somebody,” says Goldfeder. And then there’s the United States. Congress likely won’t consider any agreement until 2019, though it’s possible power could shift in one or both chambers after the midterm elections. Both Democrats and Republicans supported a trilateral agreement with Canada, and so far, Democrats have been receptive to USMCA — especially because of its labor protections, which have been issues that Democrats, more so than Republicans, have been agitating for with NAFTA. Senate Minority Leader Chuck Schumer issued a statement that praised the president for renegotiating part of the deal, but added that Congress would need to consider implementation measures for some of the labor provisions and access to dairy. It might be an early sign that Democrats won’t give Trump an easy win — though they’ll likely want to avoid the economic consequences of totally torpedoing NAFTA too. In other words, both Democrats and Republicans want the dairy farmers of Wisconsin on their side. Trump gets a win on his trade strategy — but what does it all mean? Trump promised to renegotiate NAFTA — and he did. But it’s not exactly the brand new deal he says it is. Some changes are substantial, such as the provisions about automobiles, but the core of NAFTA remains intact. It will also likely do little to address Trump’s big pet peeve about trade deficits. “They have fixed some of the problems with NAFTA, they have brought it up to date, they have expanded the scope of the agreement, but they have in no way fixed what seemed to be the fundamental problems of NAFTA by President Trump, or the kinds of thing he identified during his election campaign in 2016,” Wood said. NAFTA was negotiated more than 25 years ago, and elements of it were definitely outdated for the simple fact that technology has transformed in those years. USMCA has introduced digital trade protections and other updates, but it perhaps didn’t go far enough. Many of the more forward-looking agreements, such as digital trade protections, were borrowed from the TPP — basically a retread of negotiations already completed. And the main success of USMCA revolved around, well, automobiles. “It’s amazing that in 2018, cars is the main driver of a NAFTA rewrite, but here we are,” quips Marc Busch, an international trade law expert at Georgetown University. This sounds like Trump being Trump, but trade deals aren’t usually done under threat. “We’ve never seen this — not just with carrots but also with sticks,” Goldfeder says. The question is how long this strategy can last, and whether it will work on harder trade deals, for instance with Japan and the European Union.